Todas as tarifas incluem roupa de cama e toalhas, electricidade, limpeza final de aluguer e logs para o fogo. O imposto turístico é adicionado automaticamente às taxas de reserva. Situado no coração da maior área esquiável da Europa, Fleurs des Montagnes é um chalé individual e, portanto, ao contrário de um apartamento, você não será perturbado por pessoas acima, abaixo ou ambos os lados de você. Ele está situado na parte da frente dos procurados chalés após Les Coprins e goza ininterruptas vistas deslumbrantes, muitas vezes utilizados para cartões postais da aldeia. Estamos a apenas 100m de um teleférico levá-lo a 650 km de pistas marcadas, ou você pode pegar o "navette" que pára perto da parte inferior da unidade para os outros elevadores, que são apenas alguns minutos. O elevador mais próximo também vai levá-lo para alguns maravilhosos caminhos de montanha a pé, se o esqui não é para você. Chatel tem um registro de neve invejável devido às suas encostas do norte e um investimento pesado em canhões de neve, e mesmo na temporada pobre 2016/2017, os visitantes, segundo informes, perderam apenas 5 dias devido ao mau tempo. Este belo chalé é construído em 3 andares, incluindo uma grande sala de estar / jantar com um extenso terraço virado a sul e cozinha de designer separada, todos com vistas maravilhosas ininterruptas. Temos 4 quartos, dormindo 8 pessoas em camas permanentes, além de espaço para um bebê em um berço. Existem 2 x quartos duplos (um com uma cama de casal e um com um padrão), um quarto twin e um com beliches adulto de tamanho. Os quartos estão localizados no chão e 2º andares com quartos de banho / chuveiro e banheiros em cada. Os preços incluem impostos locais de turismo, electricidade, roupa, registros e limpeza. Existe uma cozinha bem equipada com forno, microondas e máquina de lavar louça, assentos para refeições e salão e uma sala de secagem / arranque muito eficiente. Suíça está a poucos minutos de distância de carro, ou de esqui usando o elevador de cadeira de 100m de moradia, que também irá levá-lo para a área ligada. Navette ônibus leva você para outros elevadores a cada 20 minutos a partir de 8. 15am até tarde da noite. 40 ensaios imediatamente circundante Chatel- 5 preto, 17 vermelhos, 12 azuis 6 verdes e 27 canhões de neve. Garagem e mais espaço de estacionamento disponível. Detalhes de Verão: Ser virado a sul do chalé recebe acima sunshine média. Há uma vasta selecção de actividades de Verão, incluindo 200 km de caminhos marcados e ciclovias em Portes du Soleil, piscinas, passeios a cavalo, pesca, ténis e um tobogã durante todo o ano de run todos disponíveis em Chatel. Lago Genebra todas as suas actividades de desportos aquáticos fica apenas a 40 minutos de carro e há uma abundância de desportos fluviais, como rafting, caiaque, canoagem etc. 20 minutos de distância, no vale Abondance. Unidades de máquina de lavar roupa na sala de secagem de prateleiras em ambos os banheiros para armazenar sacos de lavar etc. Cesto de roupa no banheiro. Sala de secagem (não secadora), incluindo armazenamento de inicialização, que é altamente eficaz e vai secar jaquetas de esqui, botas etc. etc. em nenhum momento a todos. Individual chalet which is very nicely furnished and well-equipped. It is spacious inside (we were a party of 6 adults) and the outdoor terrace area gets the sun all day long. The heating is very effective, there is ample hot water and the beds are comfortable! The kitchen area is well-appointed and the supply of board games and DVDs is extensive. The reservation and access arrangements went very smoothly and pre-booking ski passes at a discount price was a bonus. Located up in Petit Châtel it is away from the noise of the resort. 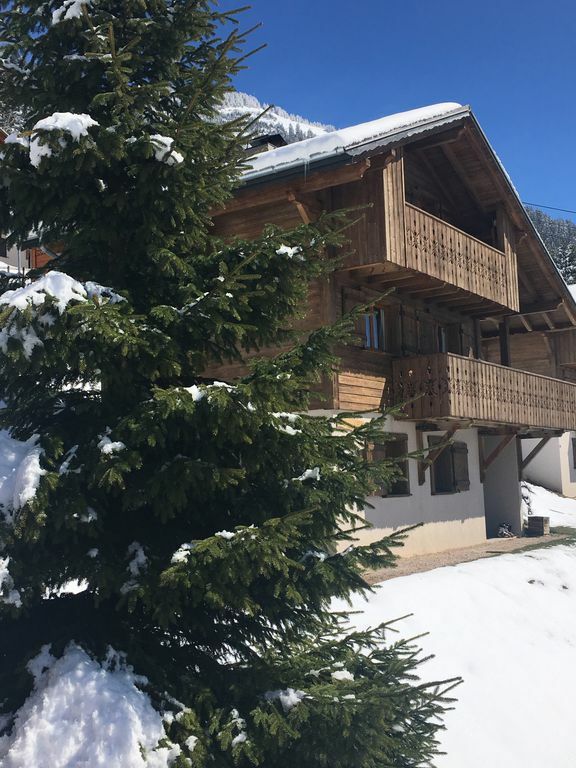 It is near the ski shuttle bus route which takes you into the village or as far as Linga but good skiers can access the Portes de Soleil area from the Petit Châtel chair-lift which is within walking distance. Please note that access to the chalet is up steps from the garage and parking area so would not suit anyone with mobility issues. We are definitely considering returning in the future. Dear Carolyn - many thanks for your very kind and lovely review; we are so pleased you liked the chalet and trust you enjoyed the skiing too! You were a perfect guest and we would be delighted to welcome you in future years. Stayed 1 week 16th Feb, 2 families. We had a wonderful holiday. Chalet is well furnished, everything you would need. Showers are good, plenty of hot water, there were 7 of us. Living area has amazing views, lovely open fire, comfy sofa after a hard days ski. Kitchen well stocked with appliances. The only reason it does not get 5 stars: 2nd double bedroom is very small + car parking - 2 spaces, 1 outside is large, the other in the garage is designed for a small car, so the car stuck out (other one would not fit width). Also it is 1.3 miles from the town, so a fast 25min walk down hill, longer back! Plus the last road up to the chalet is a steep 300m lane, which if it snowed you would not get up, unless have a 4 wheel drive, then you have 50 steps to reach the chalet from car park. Ski lift Barbossine near the chalet is not busy, but this area is for beginners. We preferred to drive to Pre la Joux where you have the option of 2 chairs & ski back to your car! We are so pleased that you had a wonderful holiday and loved the chalet; we never tire of the views at any time of the year (and are always pleased to see how much quicker the steps become after a couple of days!) This and the open fire & comfy furnishings all contribute to the cosy feel. The free navette service, which stops by the end of our drive, covers the 1km to the town centre every twenty minutes during the day (less frequently in the evening) and then on to the lifts at Linga which lead to the higher altitude skiing and this is how we access the area. The closest lift at Petit Chatel is, as you rightly say, close to the chalet, not busy, and leads to some very quiet and attractive red and blue runs with wonderful panoramas, and with the new link at Vonnes, mean it's now possible to easily ski around and into the main ski area - a godsend during peak weeks in any ski resort! Thank you for your very kind personal note; you were great guests and we'd love to welcome you again. Très bien placé , dommage de devoir monter 60 marchés !!! Mais cela améliore votre condition physique pour le ski! Merci pour vos commentaires aimables et votre meilleure note; Nous sommes très heureux que vous ayez apprécié vos vacances de Noël dans notre chalet et nous vous remercions d'avoir déjà réservé Noël 2018! Thank you for your kind feedback and top rating; we are very pleased you enjoyed your Christmas holiday in our chalet, and thank you again for booking Christmas 2018 already! My second stay at this lovely chalet. There are wonderful views over the valleys. At night I could see the lights in the sky - piste bashers! The accommodation was fine and the facilities ample. The good thing about the Chelet's position up in petitchapel is that you are away from the bulk of tourists yet close enough to enjoy the village. Looking forward to next year. 6. Instruction booklet states that you have to do the final clean. We have always left rental properties clean and tidy but have never been expected to do the deep clean requried before next party moves in. This is required apparently as cleaners are 'expensive' on change over days. Yes, that is what we are paying for. And finally.... So on our final evening having completed cleaning the toilets, hoovering and mopping the floors, we went to bed early as we had an early start. However no sooner than we had retired than the door bell went at 10.30pm. It was a couple who were friends of the owners and wanted to know what we were doing in their car space and indeed their chalet. We explained that we were renting. They wouldn't take no for an answer and implied we had made some mistake as the owners had said they could come out on Friday. This went on for some time until they reluctantly left asking us when we would be gone the following day and implying it was our fault that after a long journey they had nowhere to stay. We had taken friends with us on this holiday who had not been to Chatel before and although (as usual) the skiing was great the experience at the chalet was an embarassment to us. I am so sorry you had such a negative experience and whilst reasons don't make it better there are some extenuating circumstances here - most of which are extraordinary. Firstly the garage contains bathroom fittings as the local plumber engaged to replace one of the bathrooms died unexpectedly just days before he was due to do the work and it became impossible to find an alternative at short notice, or to find storage. Secondly, my husband was whisked into hospital where he remained for over 3 weeks in late February with me daily commuting over an hour each way and I took my eye off the ball which included telling our friends (who were due to arrive Saturday) that they couldn't arrive Friday. This is entirely my fault as we were due to arrive on Saturday ourselves. However, there are some issues here that most definitely should not have occurred and I will be taking them up with our local agent. All beds are always made up, a welcome pack should have been put out and the agent should have called on you to check everything was ok. Cleaning is also always included and this was clearly stated on the website as are the local agents contact details in case everything is not as it should be. The agent does try to visit every renter but sometimes guests are not always in, even if he returns more than once. Clearly we need to ensure guests know he has called and to leave contact details for them to call him, particularly when something goes wrong as it clearly had with your stay. We have been renting our chalet for nearly 20 years and we receive very positive reviews. I never want anyone to be disappointed and as a result pay considerable sums to ensure the guest experience is a positive one , but can only address issues when I am made aware of them. I am therefore grateful you have done so in order that I can put them right and would like to assure you this is not how it usually works! Please contact me directly via email so I can offer redress. TODOS OS PREÇOS INCLUEM ELECTRICIDADE, ROPA DE CAMA, FIM DE LIMPEZA DE ALUGUER, IMPOSTO TURÍSTICO E REGISTROS. Situado no coração de Portes du Soleil e minutos do centro da vila, Les Fleurs des Montagnes é uma moradia geminada com magníficas vistas para as montanhas de seus 'terraços e tem uma localização perfeita tanto para férias de inverno e verão. O Portes du Soleil compreende 650 km de pistas de esqui interligadas, que atravessam a fronteira para a Suíça, mas está apenas a 40 minutos de carro do Evian, às margens do Lago de Genebra, com o seu casino, praias e spa. Ski: A moradia está situada a uma curta caminhada a partir do próximo elevador com o ônibus parando perto da parte inferior da unidade para levá-lo aos outros. Principiantes e esquiadores experientes / pensionistas estão bem servidos com grande esqui disponível para todos até o final de abril / início de maio.